Chief Deputy Steve Turner moved to Roanoke County in 1967. He served in the Army as a Military Policeman at Fort Bragg and in Pusan, Korea from 1973 to 1976. His duties included assignments in confinement facilities as well as special security details. Upon his end of his term of service he received the Army Commendation Medal for his service as the non-commissioned officer in charge of the Mobile Security Section at the Provost Marshall Office in Pusan. After leaving the service he began his career with the Roanoke County Sheriff’s Office as an auxiliary Police Officer in November 1976. 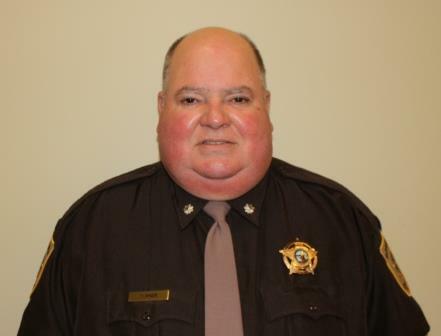 In September of 1977 he was hired as a Deputy Sheriff for Roanoke County working through the ranks to Lieutenant assigned as a shift commander in the patrol division. At the formation of the Roanoke County Police Department in July 1990, he was transferred to serve as a shift commander within the new department. He has served in many capacities throughout the department with his last assignment as the Commander of Special Operations. After 25 ½ years with the Police Department, he has transferred back to the Sheriff’s Office where he was appointed as the Chief Deputy. In addition, he has served as a volunteer fireman at the Cave Spring Fire Department from 1978 to 1983. He has been honored to serve his country and the citizens of Roanoke County in many capacities for more than 42 years. He looks forward to serving the citizens in his role as the Chief Deputy for the Roanoke County Sheriff’s Office. A longtime resident of Roanoke County, he currently resides in the Hollins area with his wife Vicki. His children Jennifer and Lindsey graduated from Northside HS with Lindsey currently attending Campbell University. All of the family are members of South View United Methodist Church. June 1972 Honor graduate, Andrew Lewis High School, Salem, VA.
Sep 1977 –December 2015 Attended many courses of instruction in various law enforcement and management subjects. This included certification as an instructor to teach in the Police Academy. Also included were many courses in ADA, harassment, personal conduct, etc. June 1979 Awarded an Associate in Applied Science Degree in Administration of Justice, with honor from Virginia Western Community College, Roanoke VA. Completed courses in constitutional law, criminal law, forensic science, patrol administration, corrections, sociology, and accounting. Jan-April 1993 Completed the Administrative Officer’s Management Program at North Carolina State University. September 1994 Completed the Criminal Justice Supervision Institute at Radford University. December 1998 Awarded Bachelor of General Studies with a concentration in Police Management from Radford University. Completed courses in organizational design, administrative law, public speaking, public administration, computer information systems, and business management. September 2006 Completed the New Chiefs/Deputy Chiefs Training School by the Virginia Police Chiefs Foundation. Chad Beheler was raised in Botetourt County and attended Lord Botetourt High School graduating in 2001. After graduating he immediately enlisted in the United States Marines. After getting honorably discharged, Chad then began his law enforcement career with the Roanoke County Police in 2004. Chad attended the Roanoke City Police Academy and upon graduating began his training as a road officer. During his 12 years in Roanoke County he participated in multiple assignments throughout the department. The last two years of his time at the Roanoke County Police Department Chad served as the School Resource Officer at Hidden Valley High School. In January 2016 he was given the opportunity to serve the community as a Deputy with the Roanoke County Sheriff's Office. Chad will serve as the Community Outreach Coordinator and very much looks forward to serving in this capacity. Chad will also be working with the Roanoke County Elementary Schools in the future. He asks that you do not hesitate to contact him for any community programs that he or the Roanoke County Sheriff’s Office can assist with. Chad currently resides in Roanoke County with his wife, daughter, and two Boxers. Parris Island initial boot camp, Marine Combat Training, School of Combat Engineers. My time spent in the Marines while being deployed consisted of kinetic clearing operations, multiple daily patrols in different cities throughout the Al Anbar Province of Iraq and searching homes of possible insurgents, collecting ordinance that were being used to deploy IED’s and disposing of those items, all while trying to keep a positive relationship with the citizens of Iraq. Combat Action Ribbon (earned during Operation Matador while deployed to the Syrian border), National defense medal, Iraq Campaign, Selective Marine medal, Global war on Terrorism, Global war on Terrorism Service.